It’s just one month left before Wanderlust NZ and Australia 2014 unfolds. 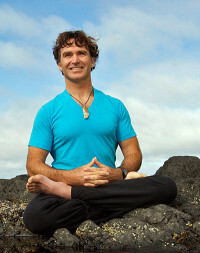 To whet your appetite, I dragged Eoin Finn away from a beach where he’d been indulging in one of his biggest loves – surfing – and got him to talk about his other biggest love – yoga, including what yoga teachers need to master. Eoin dubs his style of yoga Blissology, and it soon becomes apparent why… this is one seriously chilled out dude! But then, his Huffington Post byline reads Yogi, Surfer and Blissologist. Well, as it turns out, yes really. After chatting to Eoin for fifteen minutes I was left satisfied that this guy is really all about the bliss and does care about connecting to the deep vibration of Love in all that he does. Maybe our Heads of State could take a few lessons from Eoin. Eoin’s love of the Bliss though is tempered with an understanding the life is bitter sweet – that we have to have the loss and the grief to have the love, and any attempt to turn away from pain is ultimately turning away from our very own selves. Click here to see Eoin’s schedule for Great Lake Taupo Wanderlust 2015. Eoin Finn is a yogi, surfer and blissologist residing between Vancouver, BC, Venice, CA and Bali. He teaches his unique and transformative Blissology Yoga classes and workshops across the globe. Blissology is the art of tuning into the force that makes us feel connected to each other and the planet and using it to guide us so that we achieve our personal goals while minimizing our impact on the web of life.